The widowed Marjorie Rollo, whose husband George Graeme had died in 1575, married for her second husband John Graeme, afterwards of Balgowan; at the time of the marriage he does not seem to have any landed designation beyond being the younger son of Graeme of Garvock. The family of Garvock, like that of Inchbrakie, was descended from a cadet of the House of Montrose, but their ancestor sprung from it before the creation of the earldom or barony. 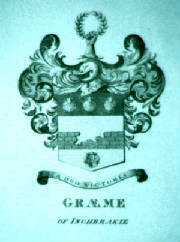 The first Graeme of Garvock was William, fifth son of Sir William Graeme, twelfth in line, his mother having been the Princess Mary, daughter of Robert III, King of Scotland; the Graemes of Garvock to this day bear the double tressure on their coat, signifying their royal descent. Marjorie Rollock’s second husband was the great great grandson of this Sir William Graeme, and the ancestor of Lord Lynedoch the hero of Barossa. Marjorie bore Balgowan several children and was the mother of a large family, as there were at least six children, of whom Inchbrakie was the father. We have not space in this sketch to touch on the children of this second marriage beyond calling to our reader’s notice that the eldest son, John of Balgowan, was the half brother who will be so often noticed in the sketches of Marjorie’s two elder sons, the third Laird and Bishop George. Balgowan was purchased by Marjorie’s second husband, Mr Graeme, in 1584 from Lord Innerneath; this was followed in 1596 by the acquisition of Newraw (when Marjorie’s son Patrick, the third Laird of Inchbrakie, witnesses the charter; his next acquisition being Meikle College from the lands of the Abbey of Dunfermline in 1601, and the lands of Kippen in Strathearn, in 1605. On the 24th May 1596, we find a most elaborate specimen of Marione’s (possibly should be Marjorie) handwriting at the foot of a discharge, given by herand John of Balgowan, to Alexander Murray of Woodend for 400 merks. It proves that Newraw had belonged to the late Patrick Murray, in it Marjorie styles herself "Marione Rollock, Lady Inchbrakie, Spouse to John Graeme of Newraw," and, one of the witnesses being John Graeme, "our sone lawfil, we may therefore conclude John was of legal age, and that hisparents must have been man and wife for at least sixteen or seventeen years. Marjorie was alive in 1610 we know, as her name appears in a charter of certain lands, with those of her grand daughter , Annas Graeme of Inchbrakie and her husband Edward Toscheoch of Monzievaird. It is of the children of Marjorie Rollock and her first husband George Graeme second Laird of Inchbrakie, that we now treat here, the sketch of their eldest son Patrick, (the third Laird of Inchbrakie) and of George, Bishop of Orkney, their second son, will be found elsewhere. The older editions of Burke’s "Landed Gentry" state that there was a third son, John, killed at the massacre of Glenfruan, who founded the family of Graemes of Bucklivie. This latter statement is incorrect, and I shall prove by the authority of charters in another sketch, that it was a great grandson of our second laird who was the first of Bucklivie, and not his son; the Graemes of Fintrie were in possession of these lands at this date. Katherine to her kinsman, Campbell of Monzie. I have been unfortunate in not finding any trace of the settlements or contract of Annas and George Robertson of Fascally. Nicholas married the eldest son of the Laird of Cultoquhey, James Maxtone; she must have gone from her guardian’s (and stepfather’s) house at Balgowan, to her new home just three or four miles distant at Cultoquhey, where their descendant, three hundred years later, succeeds to the "Guids" and "Gier" of the last Balgowan. The third daughter Cristane (or Beatrix) married a son of Drummond of Balloch. The feu-charter of Balloch dates from the reign of James IV, and was given to a scion of the family of Lord Perth, Walter Drummond and Rollo his wife, and their great-grandson is the bridegroom. Cristane’s contract of marriage is recorded as follows: "George Drummond Senior of Balloch takeing burden for Harie Drummond, his son and heir on the one part; and Patrick Graeme of Inchbrakie, John Graeme of Balgowan, and Marion Rollock Ladie Inchbrakie his spouse, mother of the said Patrick, takeing burden for Cristane Graeme, sister to the said Patrick on the other, dated 13th Jan 1590." Eleven years later, in 1601 on the 25th October, Harie succeeds to Balloch; he gives up the Will of ane honorable man George Drummond of Balloch his father, and in 1610 a settlement of various lands and crofts is made on his wife, Cristane Graeme. This couple had several children. Their eldest boy, George, became the sixth Laird of Balloch and married twice, his second wife, Margaret Graeme of Gorthie, was his mother’s grand-niece (and Bishop George’s grand-daughter) therefore a cousin of his own; but it was the children of his first wife Agnes (sister to Lord Napier of Merchistown) who suffered so bitterly from the miseries of the Great Troubles. The Ballochs were loyal to a man. We must hope that Cristane did not live to 1644, and have her heart broken by the pain of the death of her two eldest grandsons! John was killed under Montrose at the siege of Dunkirk, and George cruelly shot to death by order of the Convention of Estates! Possibly this took place at the siege of Kincardine Castle, in which Lord Napier and his nephew John Drummond took so prominent a part, with Black Pate of Inchbrakie. If Cristane survived to know of all these sad details her one comfort must have been her younger grandson (the half brother of George and John), and the namesake of her husband "Hrie" who appears to have been a most promising lad. His kinsman when drawing up the Drummond genealogy, writes thus quaintly of the boy: "Harie now of Balloch, of whom we entertain some hopes, that he will not extinguish the Memorie of so honest and ancient a familie. The names of the Ballochs appear in the usual manner, in various "cautions" of theperiod, and we also find Cristane’s husband Harie Drummond, at variance with Edward Tosheoch of Monzievaird, the husband of her niece, Annas Graeme, regarding the loss of 300 ells of linen, stolen by some tenants of Tosheoch; John Graeme "fiar" of Balgowan is the lawyer on this occasion. Later on toward the end of the century young Harie Drummond obtains a charter of the whole Barony of Blair. Many authorities call Cristane Lady Beatrix. We now come to Lilias, the fourth and last daughter of Graeme of Inchbrakie and his wife Marion Rollo, she married twice. Firstly, William Colville of Condie, and secondly, Laurence Oliphant of Gask. Her first husband lived a very short period after their marriage, his death occurring after the birth of two daughters, Catherine and Marioni; the former’s contract of marriage is with Mr John Murray, who held successively the ministry of the parishes of Kinkell and Trinity Gask; in it Catherine is described as daughter of Lilias Graeme, relict of William Colville of Condie, now spouse to Laurence Oliphant of Ross; the contract is dated at Ross 9th February 1621, and is followed by a discharge by Mr Murray for the bride’s dower of 1000 merks, which is witnessed by George Fyffe, Archdean of Dunblane, and Mr Patrick Drummond of Leuchar. Later on Mr John Murray is not at one with his wife’s stepbrother Sir Laurence Oliphant of Gask, for in 1656 he brings an action against him. Marioni married Sir James Murray of Tibbermuire; this marriage is proved by a receipt, in which Sir James grants him to have received from Laurence Oliphant of Lamberkin, 2000 merks as tochers gude to Marioni Colville, "now my spous", as granted by contract of marriage, dated at Perth 1613. "Subscribet befoir Thomas Graham son lawfull to the umqle Robert Graham, Arcdene of Ross, 1614". The document is witnessed, "Thomas Graeme" in a fine hand and with precise use of the diphthong. In 1615, Laurence Oliphant of Lamerkin was Chamberlain to Lord Oliphant of that day, and Gask documents prove that Lord Oliphant’s Chamberlain, Laurence Oliphant of Ross, Laurence Oliphant of Lamberkin, were one and all the same man, Laurence Oliphant first Laird of Gask. There is also in the Gask Charter Chest a discharge by Lilias Graeme and her second husband, which mentions various particulars regarding both her marriages. From which we learn Lilias married Colville of Condie previous to 1601; for in that year he sells Condie to Laurence Oliphant (servitor of William Oliphant, advocate) for the sum of 3070 merks; the interest of which the said Laurence is bound to pay regularly to Colvill and his wife Lilias Graeme, or the longer liver of the two and afterwards to any heirs born to them, the payment to commence in 1602. This proves her first marriage. The discharge then goes on to show that between this later date and 1606, Lilias has not only become a widow, but has been married again to Laurence Oliphant, afterwards of Gask, who was the eldest son of Oliphant of Newton, to whom the purchaser of Condie (another Laurence Oliphant!) is now paying off the principal or capital of the purchase money. We also learn that Lilias’ first husband, Colville had owed her uncle George Graeme Bishop of Dunblane, 500 merks; the opportunity is taken to discharge that debt, which had been contracted in 1602, February 8th, when George was at Scone and still "Maister George Graeme. In this discharge our third Laird Patrick, and his young son George, are freed from all further responsibilities as the guardians of Lilias’ interest in this matter. This discharge is not registered in the Books of Council until 1613. The interest payable to Lilias from the lands of Condie had plenty of demands on it, the daughters’ dowers were to be provided, the Bishop to be paid; while in 1604 Laurence Oliphant pays for the relief of his spouse Lilias, a certain Archibald Primrose 60 pounds for William Colville of Condie’s band; while in 1617 Nicol Blair, a tailor, Burgess of Perth, makes his claim on the late Mr Colville, for which he gives receipt to Laurence for his wife. Lilias’ home for many years lay at Ross, until 1625 when Gask was purchased by Laurence from his cousin, Lord Oliphant, who gives him a charter of that barony with all its woods and fishings, and special liberty of fishing in the water Earn for three days in forbidden time; to be held of the King in blench ferm fee, for yearly rendering if asked, at the Feast of the Nativity of St John the Baptist, of a Chaplet of White Roses. This tribute was of course, in the original charter of the Barony of Gask some centuries previously; but it is interesting to note that romantic offering became the duty of the Gask Laird and his wife Miss Lilias Graeme. Two hundred years later, their descendant, Lady Nairn the songstress of Scotland, was to write her famous ballads of Charles Edward, and fifty years later still, Ethel and Lilias Blair-Oliphant compose the words and music of "Gask’s Tribute". Lilias had a long married life, and one comparatively free from care in peaceful years during the pause before the country was racked by the "Great Troubles". In July 1614, Lord Oliphant grants to Lilias, and her husband Laurence, a bond upon the lands of Lamberkin, for which they paid 600 merks. They had a family of two sons and two daughters; their eldest boy married Lilias, the daughter of Lord Oliphant, so that for two successive generations Gask was ruled by a Laurence and Lilias; in the marriage contract of the younger couple, they bind themselves to pay certain dues and teinds to Mr James Pierson, Dean of Dunblane, and his successors. Lilias Graeme’s and Laurence Oliphant’s daughter Margaret married 23rd February 1627, Mr Alexander Inglis, deputy clerk of the Register of Sasines of the Sheriffdom of Perth. The witnesses of the contract are Mr John Graham of Reidfiurne, Mr James Graham, son lawful to the umquhile Mr Alexander Graham, burrow clerk of Glasgow, and Patrick, younger son of Laurence and Lilias Graeme, and his discharge of her dower of 2000 merks is dated 1628. Their daughter Jean married Captain John Drummond, eighth Laird of Pitkellonzie, whose receipt for her tocher of 5500 merks, lies in the Gask Charter Chest, dated 22 May 1629, and fifteen years later she is left a widow when her husband is killed at Charlemont in Ireland, where he was besieging the rebels in 1644, and where he lies buried in the Cathedral Church. Lilias Graeme was left a widow for the second time, on the 22nd July 1632, when Gask’s will is given up by her; he leaves a long inventory of his goods, and has made his will on a bed of sickness on June 22nd of the same year. Her widowhood laster through all the worst of the troubles, and she saw three generations of the Barons of Inchbrakie laid to rest; her father, her brother Patrick, her nephew George, and was still alive when the fourth baron, Black Pate, her great nephew, succeeded to the estates: she thus lived to welcome Montrose and speed him to his victories. It has been said that Gask, her son, took little or no part with the Chief of the Graemes. An order from General Monch, 21st October 1651, permits Sir Laurence Oliphant to wear his sword, and allows him, his family and household, to go about their business. Lilias Graeme, Lady Gask, is growing very frail, and the hand of time is heavy on her, as a couple of receipts for her dower and other monies show us in 1654 and ’55; the firm, clear handwriting of her second marriage contract in 1606 has grown feeble, though still lending testimony to the House of Inchbrakie’s spelling of their name, forming the æ of the diphthong distinctly, when over seventy years of age; the receipt of 1554 is witnessed by two grandsons, James and George Drummond, the sons of her daughter Jean, whose husband had died ten years previously.